The Quest For The Perfect Pancake | I Can Has Cook? This may not be a quest that Harry or Hermione might find of great import but in our house The Quest For The Perfect Pancake is a grave one indeed. Myself and Niall have climbed great metaphorical batter mountains in search of the perfect and most fluffiest of pancakes. What a journey it has been, full of displays of great stomach strength and the loosening of jean belts, aided by the pancake tales to be found on the food blogosphere. We are truly not even halfway through this delicious crusade and have yet to tinker with all types of pancakes. 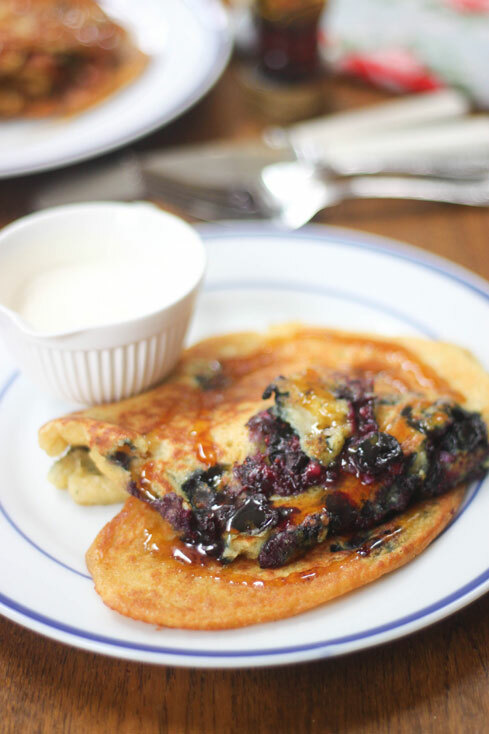 We did however stumble upon Deb’s Pancake 101 post quite recently and took inspiration from her in creating our fluffiest pancakes yet. 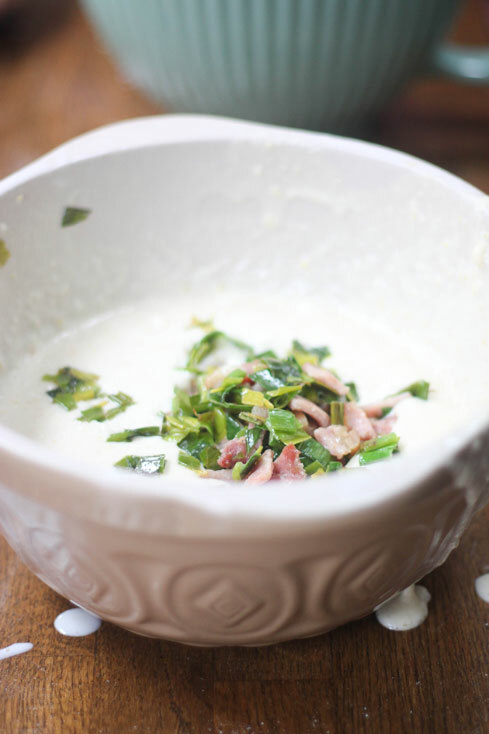 It’s a more laboured recipe than usual, but this is a quest after all, and a bit of egg white whisking was not going to keep us down. The results were certainly the best we’ve attained so far, being light and lush, but lacking in lift. And so we’re still on the look out for that perfect pancake. We’re thinking this Bank Holiday weekend could be a good opportunity for another go. Got any tips for us? 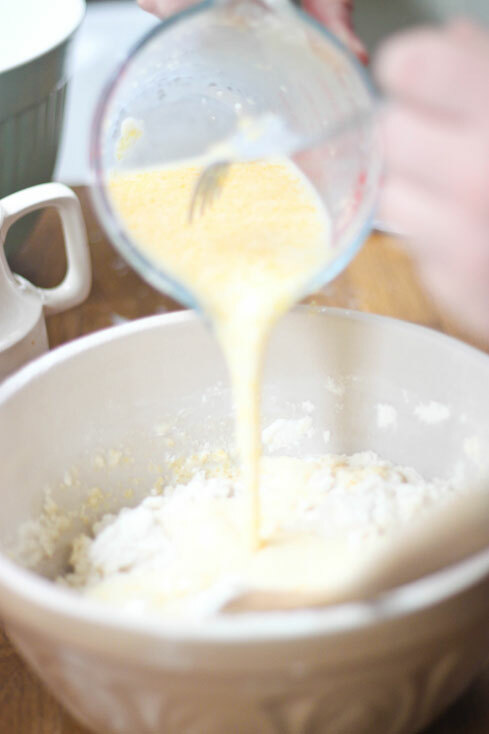 Below is the recipe for the pancake batter which we adapted from Deb’s over on Smitten Kitchen. We split the batter into two bowls and added a load of blueberries to one bowl and some fried leeks and bacon into the other. They were both fabulous, if I do say so myself, and brought the sweet/savoury debate to new heights in our house. Pre-heat a large frying pan or griddle pan over a low to medium heat and brush with butter. Separate the yolks from the egg whites and set aside the yolks. 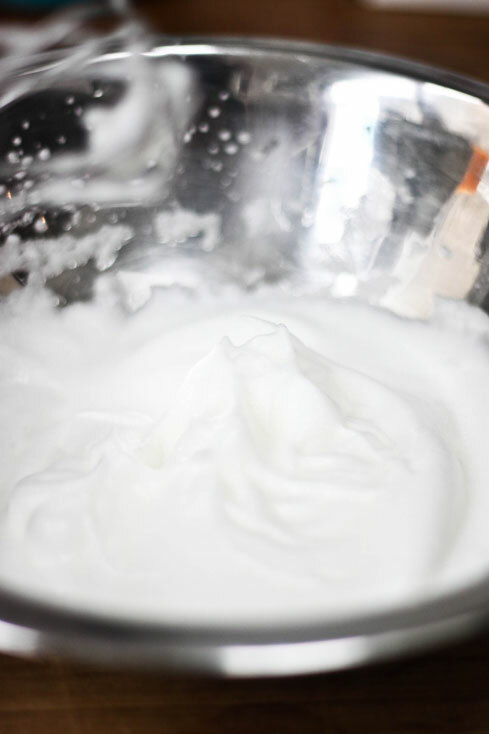 With an electric whisk, beat the egg whites until they are stiff and fluffy. 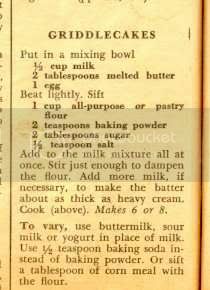 Sieve the flour, baking powder, baking soda into a large bowl and whisk together with the salt and sugar. 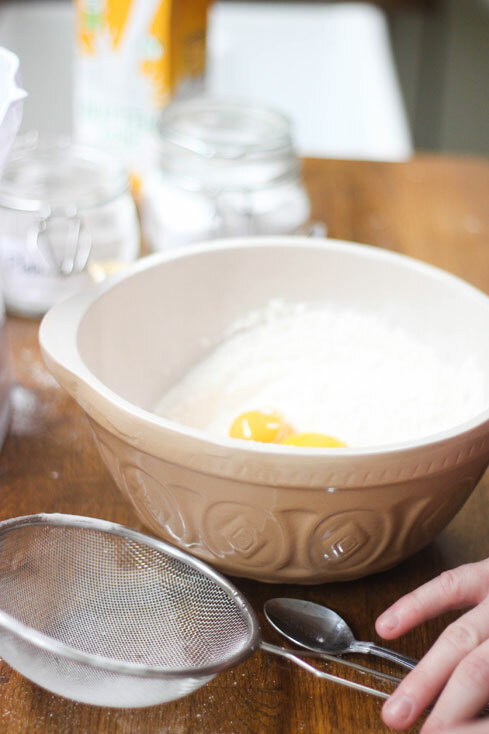 Beat the egg yolks and add them to the flour mixture. Finally, fold in the stiff egg whites until the batter is well-combined. 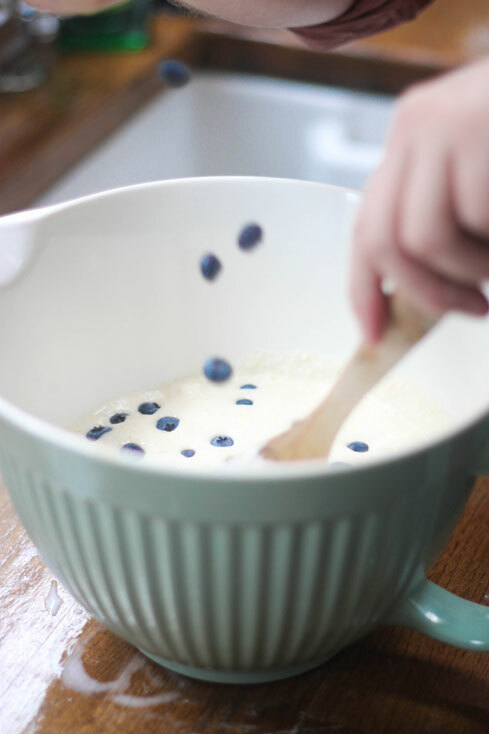 Now you can add your extra ingredients to the batter, whether they be blueberries, raspberries, bacon, leek or whatever you like. Brush the warmed frying pan with lots of butter and add dollops of the pancake mixture. 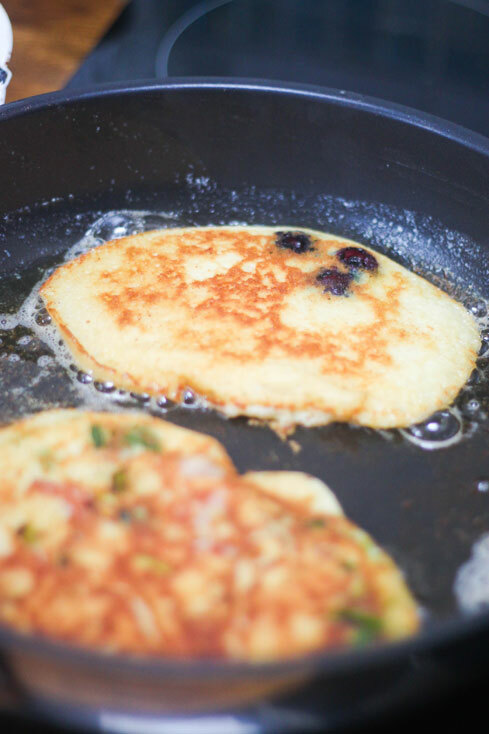 Cook gently until you see bubbles forming at the top of the batter and the edges begin to crispen up. Flip over and cook the other side until golden. Keep them warm in the oven as you cook the other batter in batches. Serve with sugar, lemon wedges, maple syrup (for the sweet and savoury) and whatever other condiments that take your fancy. Bliss! Even if the weather doesn’t clear up this Bank Holiday weekend, arm yourself with lovely fluffy pancakes and tunes like this one from Dublin based Sacred Animals collab with LA based Steffaloo. Also, I almost always double up on those ingredients as the amounts there don’t make enough pancakes for a proper breakfast for two. They get even more perfect (we find) if the batter stands for 30 minutes or so…I think it has to do with gluten relaxing. Any more than that and the raising agents are spent. Ooh! That is a good tip. Thanks! 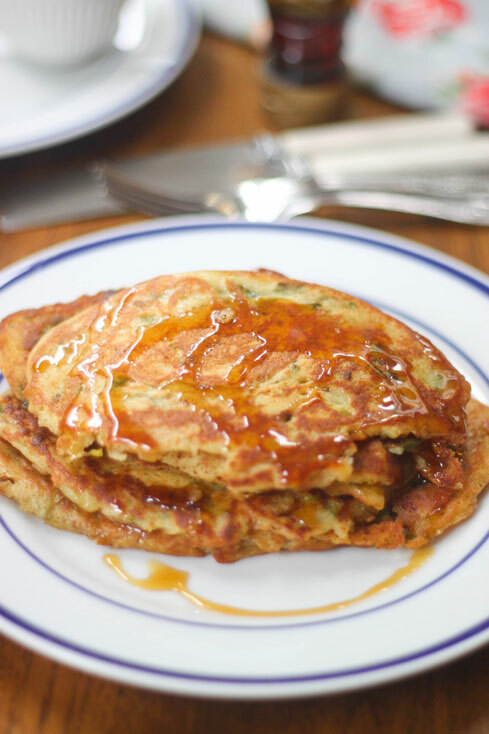 If it’s really thick,fluffy pancakes you’re after then having a look at Martha Stewart’s pancake collection is definitely worth it.I always use the recipe for basic pancakes on her website so you should have a look there ! Hey Aoife, have you ever been to this restaurant? It’s located near Kenmare and they specialise in pancakes. I don’t know if they’ll give you any recipes but it’s worth checking out if you’re in the area. I haven’t but thanks for the link! Deadly! We went there when we were on holiday in Kenmare almost 2 years ago. The daughter was a bit cranky when we were there but the pancakes were good.